A Citus cluster consists of a coordinator instance and multiple worker instances. The data is sharded and replicated on the workers while the coordinator stores metadata about these shards. All queries issued to the cluster are executed via the coordinator. The coordinator partitions the query into smaller query fragments where each query fragment can be run independently on a shard. The coordinator then assigns the query fragments to workers, oversees their execution, merges their results, and returns the final result to the user. The query processing architecture can be described in brief by the diagram below. Next, the planner breaks the query into two parts - the coordinator query which runs on the coordinator and the worker query fragments which run on individual shards on the workers. The planner then assigns these query fragments to the workers such that all their resources are used efficiently. After this step, the distributed query plan is passed on to the distributed executor for execution. Citus has three basic executor types: real time, router, and task tracker. It chooses which to use dynamically, depending on the structure of each query, and can use more than one at once for a single query, assigning different executors to different subqueries/CTEs as needed to support the SQL functionality. This process is recursive: if Citus cannot determine how to run a subquery then it examines sub-subqueries. At a high level, the real-time executor is useful for handling simple key-value lookups and INSERT, UPDATE, and DELETE queries. The task tracker is better suited for larger SELECT queries, and the router executor for access data that is co-located in a single worker node. The choice of executor for each query can be displayed by running PostgreSQL’s EXPLAIN command. This can be useful for debugging performance issues. The real-time executor is the default executor used by Citus. It is well suited for getting fast responses to queries involving filters, aggregations and co-located joins. The real time executor opens one connection per shard to the workers and sends all fragment queries to them. It then fetches the results from each fragment query, merges them, and gives the final results back to the user. When all data required for a query is stored on a single node, Citus can route the entire query to the node and run it there. The result set is then relayed through the coordinator node back to the client. The router executor takes care of this type of execution. Although Citus supports a large percentage of SQL functionality even for cross-node queries, the advantage of router execution is 100% SQL coverage. Queries executing inside a node are run in a full-featured PostgreSQL worker instance. The disadvantage of router execution is the reduced parallelism of executing a query using only one computer. The task tracker executor is well suited for long running, complex data warehousing queries. This executor opens only one connection per worker, and assigns all fragment queries to a task tracker daemon on the worker. The task tracker daemon then regularly schedules new tasks and sees through their completion. The executor on the coordinator regularly checks with these task trackers to see if their tasks completed. If necessary Citus can gather results from subqueries and CTEs into the coordinator node and then push them back across workers for use by an outer query. This allows Citus to support a greater variety of SQL constructs, and even mix executor types between a query and its subqueries. For example, having subqueries in a WHERE clause sometimes cannot execute inline at the same time as the main query, but must be done separately. Suppose a web analytics application maintains a visits table partitioned by page_id. To query the number of visitor sessions on the top twenty most visited pages, we can use a subquery to find the list of pages, then an outer query to count the sessions. The real-time executor would like to run a fragment of this query against each shard by page_id, counting distinct session_ids, and combining the results on the coordinator. However the LIMIT in the subquery means the subquery cannot be executed as part of the fragment. By recursively planning the query Citus can run the subquery separately, push the results to all workers, run the main fragment query, and pull the results back to the coordinator. The “push-pull” design supports a subqueries like the one above. Let’s break it apart and examine each piece. The root of the tree is what the coordinator node does with the results from the workers. In this case it is grouping them, and GroupAggregate requires they be sorted first. Citus starts another real-time job in this second subtree. It’s going to count distinct sessions in visits. It uses a JOIN to connect with the intermediate results. The intermediate results will help it restrict to the top twenty pages. The worker internally retrieves intermediate results using a read_intermediate_result function which loads data from a file that was copied in from the coordinator node. This example showed how Citus executed the query in multiple steps with a distributed subplan, and how you can use EXPLAIN to learn about distributed query execution. Once the distributed executor sends the query fragments to the workers, they are processed like regular PostgreSQL queries. The PostgreSQL planner on that worker chooses the most optimal plan for executing that query locally on the corresponding shard table. 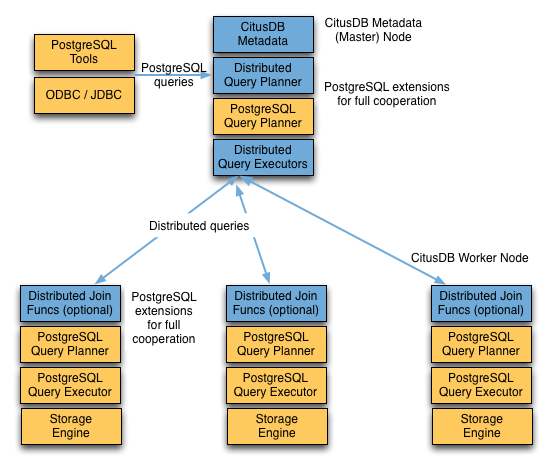 The PostgreSQL executor then runs that query and returns the query results back to the distributed executor. You can learn more about the PostgreSQL planner and executor from the PostgreSQL manual. Finally, the distributed executor passes the results to the coordinator for final aggregation.